We compute the radially symmetric coherence between multibeam bathymetry and satellite gravity grids in 25 areas distributed around the world. In contrast to previous studies employing one-dimensional analysis of data along profiles, our results cannot be biased by unseen off-track topography. The mean coherence averaged over the 20–160 km waveband, and the shortest wavelength at which coherence is above 0.5, vary with tectonic setting. Seamounts and slow spreading ridges have high (>0.7) mean coherence down to ~20 km wavelength, other spreading ridges and trenches have intermediate (0.5–0.7) coherence down to ~20–30 km wavelength, and continental shelves have low (<0.5) coherence at all wavelengths. In the areas with highest mean coherence, the shortest wavelength at which coherence is above 0.5 decreases as mean depth decreases. 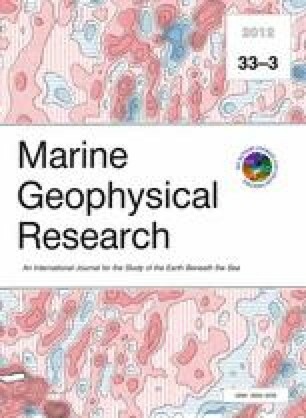 The filter employed in the bathymetric prediction method of Smith and Sandwell (J Geophys Res 99(B11):21803–21824, 1994) selects the most coherent parts of the bathymetry and gravity spectrum. The comments of two anonymous reviewers improved this manuscript. We thank Dave McAdoo for helpful comments. GMT software (Wessel and Smith 1998) was used to make figures and perform computations. The views, opinions, and findings contained in this report are those of the authors and should not be construed as an official National Oceanic and Atmospheric Administration or U.S. Government position, policy, or decision.